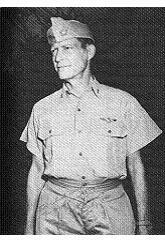 The Pacific War Online Encyclopedia: Davis, Arthur C.
Table of Contents Next: Davis, Glenn B.
Arthur Davis was an aviator who served as Nimitz' air officer in the early months of the Pacific War. He was named to take command of Yorktown at the time of the Midway operation, but the ship was lost before he could assume command. He was reluctantly chosen by Spruance as his new chief of staff after King ordered that all commanders with a surface background must have a chief of staff with an aviation background (and vice versa.) Davis had commanded Enterprise during the Eastern Solomons battle and proved a capable and congenial chief of staff to Spruance in spite of the "shotgun marriage" aspects of the assignment. Buell describes him as a "lean, rough, aggressive" and unnuanced leader who "moved decisively and intelligently", while Tillman (2012) describes him as capable but distant.